An immortal line in wrestling history, and if you're a fan of WWE then you've more than likely heard it a hundred times or so on DVD or the Network. Well that was now 20 years ago, and it is an anniversary of some note. Some people may look at the first episode of Nitro, replete with returning Lex Luger and live-event atmosphere, as the first shots in the Monday Night War. Some may point to the signings of Hogan and Savage as Ted Turner's first great body blows to the then WWF's New Generation, who were struggling to replace the Superstars of the 1980s and now competing for ratings with them. However, in comparison, these were mere skirmishes, the rumblings of disaffection, the water straining at the dam. Scott Hall's one-line introduction was wrestling's equivalent of the assassination of Archduke Ferdinand in 1914. War was not only inevitable, it was here. 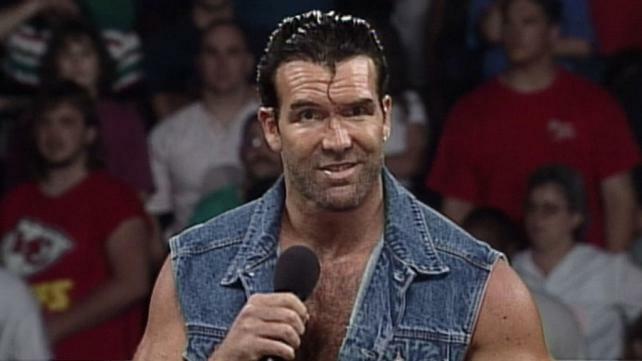 Hall himself was on familiar ground, and some loyal stalwarts may have been forgiven for thinking “Yeah, you're the Diamond Studd!” after his previous WCW stint in DDP's Diamond Mine stable, but to the wider wrestling public he appeared in full gimmick as Razor Ramon. No on-screen caption, no “It's Razor!” from the commentary desk; with the oiled-back hair, the toothpick and familiar grin, we were in no doubt as to who he was. Most importantly, this didn't feel like a début. With such blurred lines, in an era when kayfabe was still king, we didn't need the hindsight of 20 years of repetition to know this was going to be huge, ongoing, and industry changing. Whilst it might not have been “still real to us,” after the McMahon court cases of the early 90's, mostly we were still reliant on dirt-sheets or the promotions themselves for news. 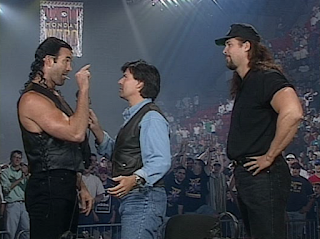 The curtain call incident at Madison Square Garden between the leaving (including Hall) and remaining members of the Kliq, was not common knowledge, nor was their industry influence, but it was still a potential threat to this angle. Too little respect has been given to the WCW staff and talent for the sell they did on this, it was convincing, with the shock being palpable and making it seem for all the world like a genuine invasion from WWF. Razor Ramon, the former Intercontinental Champ and star bad guy (pardon the pun) of the New Generation, was standing in a WCW ring with his ego showing for all the world. Everyone remembers what happened in Montreal at the Survivor Series in 1997, Bret Hart was leaving for WCW but he still was WWF champion. He was of course booked to face Shawn Michaels that night and between the 2 of them and Vince McMahon they couldn't come up with finish that suited all parties. By the time the match began, Bret was under the illusion that a finish had been agreed, there would be run-in's that would cause a schmozz (DQ) and Bret would then drop the title to Michaels/someone else the next night or whenever. Of course, McMahon had other ideas, he thought 'business' should be done and Bret should drop the belt when he says (that night in Montreal) and so, the 'screwjob' was undertaken, Michaels left with the belt, McMahon stayed at ringside while Bret smashed the place up after spitting in his eye and we had a whole new era in the WWF while Bret went off to WCW and a huge payday. Now, this little column is not me bringing up the 'Montreal Screwjob' again (although it is a topic I like to discuss) it's to do with what I put as a title, doing business on the way out. So if you're leaving a 'territory' the right thing to do is pass the torch on the way out, just like McMahon wanted Bret to do. So,I am sitting at home skipping through the new DVD release of WWE Our Nation's Pride: The Best Canadian Superstars and it features a match with Trish Stratus who is leaving the WWE, the match with women's champion Lita that night at Unforgiven 2006 will be her last in the company so instead of 'putting Lita over' and making her look strong as she'll be still there while Trish will be gone, they booked it so that Trish wins the title even though she's leaving. For me, reeks of double standards. Some might say the issue with Bret is different, WCW was around at the time, McMahon was worried that Bret might turn up on WCW TV with the WWF world title and it was and the title win for Trish was a thank you and a moment for her and the fans as it was in her home town on Toronto but I'm sorry, for me, it has no bearing on the situation, double standards, McMahon all over. The DVD, which of course is pictured above, features a good 20 matches over 2 discs and they are supposed to represent the 20 best matches featuring Canadian wrestlers,what do you guys think of the list which is below? I am sure you guys can think of many of your own that would make the list, hit me up on twitter with your choices and thoughts overall with what I have written. The latest WWE release celebrating the US title is a collection of 30 matches covering title matches from Jim Crockett Promotions, WCW and WWE and is hosted by John 'Bradshaw' Layfield. The first disc covers the JCP years from 1977 to 1989 and the standout matches features Magnum TA. The first of these is the classic 'I Quit' match against then US champion Tully Blanchard at Starrcade 85 in a steel cage. Magnum in the introductions is actually labelled as the 'Vastly Popular' Magnum TA though sadly Tully isn't called the 'Despicable' which would have been awesome. This isn't a great wrestling match but a vicious and violent war with great heat which is what it should have been. With double blood adding to the drama, Tully manages to get a wooden chair which he breaks so he can stab Magnum with it. The hero isn't done though and manages to reverse things as Tully quits in order to save his eyesight. The challenge of Nikita Koloff is up next for Magnum and we get the final match in their best of 7 series for the gold, with the USA vs. USSR dynamic creating another heated feud. This again was full of drama and this time Magnum cannot beat the number games as Krusher Kruschev makes a late intervention to enable Nikita to use the steel chain for the wildly unpopular title change. Other matches don't meet those high standards. Not even Barry Windham can do anything with the Junkyard Dog, Roddy Piper vs. Greg Valentine is a TV angle sandwiched between two Valentine interviews. A Ric Flair vs. Ricky Steamboat match from 1977 is a rare find but is hampered by a non finish and unsurprisingly isn't helped by Andre the Giant getting in the way as special referee. Rounding up the first disc are Dusty Rhodes and Lex Luger, their meeting in a cage at Starrcade 87 is a pale imitation of the Magnum/Tully a couple of years earlier. The main issue is that Lex just isn't very good at dominating matches for long periods and the match soon drags. Dusty's next opponent is Bobby Eaton and is much more fun but as an ending which defies any logic and comes out of nowhere. Finally we see Sting challenging Luger in what was a good and well constructed match which shows that Sting was clearly going to be leading the company in the future but what was beginning to be a serious pattern the match led to a non-finish. We then move onto WCW and matches covering 1991 to 2001. This is far and away the most disappointing disc of the three. Matches are full of cheap finishes, people interfering which led directly to the finish and lots of ref bumps. If you like drinking games then you won't be sober if you have a drink every time that Mickey Jay takes a bump. Among the limited highlights are Raven doing a wonderful job in continuing the elevation of Goldberg as a major star for the promotion. This was a great example of the right way of doing things. Bret Hart was also a standout as the heel tormenting and controlling things against DDP in a match from October 1998, the only thing though is why WCW had Bret as a bad guy less than a year after his debut. Steve Austin vs. Great Muta from Spring Stampede 1994 could have been a classic but suffers from a plodding place and a terrible finish when the top rope rule came into play. Ricky Steamboat and Dustin Rhodes from early 1993 was going in the right direction until Barry Windham wandered out to DDT Steamboat on the floor and that was that. We did get a clean finish between Dean Malenko vs. Chris Jericho and everything looked great but they got less than 5 minutes. Eddy Guerrero's title winning effort against DDP was decided entirely by a nWo run-in. Rick Rude's victory over Sting in 1991 was down to pre-match attack by Luger, though at least Sting was polite enough to get a lift back to the arena in an ambulance rather than driving it himself as he made his return to defend the gold. Rounding off the disappointment was Bret winning the US title against Goldberg despite not getting any offence and barely being able to walk thanks to yet another nWo attack. Curt Henning defending against the The Giant which only existed for a post match appearance from Sting which admittedly the fans reacted massively to. Finally Booker T won the title from Rick Steiner at WCW's final PPV which was entirely down to a run-in from Shane Douglas. The WWE disc is the best of the three and is dominated by John Cena. First up we see the 'Doctor of Thugonomics' making his first Mania in-ring performance against the Big Show. It seems a different world to see him getting a universally positive reaction but he did. The match was pretty good as well. Also featured was the first US title John Cena's open challenge which was accepted by Dean Ambrose and fought in front of a rabid post Mania Raw crowd which worked due to the main focus of teasing finishes and reversals. Cena's final appearance was to drop the title to the returning Alberto Del Rio, what stands out was the match really should have got at least another 5 minutes and even more clear is that the WWE got it badly wrong having Del Rio come out as a heel with Zeb Colter. The 3 Way Submission Count Anywhere match with Daniel Bryan defending against The Miz and John Morrison was excellent and much better than I remember despite the efforts of Michael Cole to ruin it. Cesaro's title defence against Tyson Kidd was also a lot of fun and was wrestled in a very different and technical style which worked great in front of an appreciative NXT crowd. Other highly entertaining matches were MVP defending and losing to Matt Hardy in a feud that I could barely remember, another MVP title run was also featured and ended this time by Kofi Kingston who was still in his Jamaican phase in a rare face vs. face battle. In stiffer style battles was Rusev beating Sheamus in a WWE Network exclusive which was better than you may think and was a reminder that Rusev and Lana not that long ago were major and credible main eventers. The main criticism that I have for the first two discs were the number of matches with poor finishes and that's where the final disc shines through as only one match as a DQ finish. That is Kurt Angle's title defence against The Undertaker and that at least is understandable as it was building up to the big WWE vs. Alliance match at the Survivor Series 2001. I feel that this could have been a fantastic set but there are some really poor matches selected which would have been easy to swap them for other matches especially the WCW disc. A decent effort overall but the overwhelming feeling is that it is a bit of a missed opportunity.